Is there something for everyone in a new vision for Tongass roads? Over the summer, Alaska got the go-ahead to propose its own alternative to a federal rule most states have to follow. The Roadless Rule prohibits new roads from being built in wilder parts of national lands. It’s something the state has been battling for decades. But now, the issue seems to be moving forward fast. 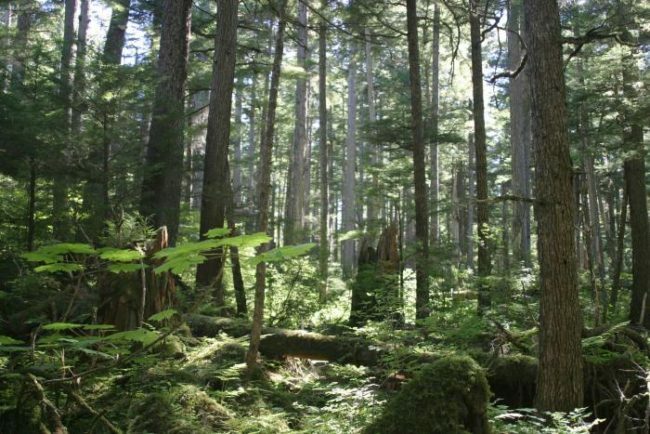 On Tuesday, a citizen advisory committee released new recommendations, which could shape the future of the Tongass National Forest. The thing to keep in mind about the four new options being recommended is that they represent a spectrum of ideas about how the Tongass should be managed. On one end of the spectrum, nothing new would really happen: Things would stay the same, and road-building would remain difficult in some parts of the national forest. On the other end, the national Roadless Rule basically wouldn’t apply to Alaska. Andrew Thoms, with the Sitka Conservation Society, said the advisory committee weighed these options carefully. “People saw that Southeast rural communities are facing challenges and there are no easy answers,” Thoms said. Gov. Bill Walker appointed Thoms and 11 others to the Alaska Roadless Rule Citizen Advisory Committee in October to represent various stakeholders around Southeast Alaska. The state has long maintained the region needs better access to logging, energy and mining opportunities, and that would be easier without the Roadless Rule hanging over the Tongass. Thoms said the group agreed they’d like to see a sustainable timber industry kept alive. But where do you strike the balance? “I think new road-building that opens up new areas for logging, especially on landscapes like Prince of Wales that’s already been heavily impacted, could cause some big problems,” Thoms said. Two of the options on the spectrum would scale back some environmental protections. Right now, the U.S. Forest Service can’t build roads through areas with the top salmon producing watersheds, known as the Tongass 77, or Audubon-designated habitat important for wildlife and fish. One of the options would do away with both of those protections. Thoms said the message the committee heard from a lot of the community meetings was this: Keep things as they are. The Forest Service has already received over 140,000 public comments on this. In fact, they’re still combing through them. But Thoms said the Forest Service hasn’t analyzed the responses yet. At the public meeting in Ketchikan, the community input was more split. Bert Burkart said that’s not surprising. He’s the President of the Alaska Forest Association, a consultant with Viking Lumber and part of the citizen advisory committee. Burkhart prefers option D — the very end of the spectrum. The one that said the Roadless Rule basically doesn’t apply to Alaska. Still, he said he’d take the closest other outcome. “But it’s still not what we’re shooting for,” Burkhart said. It’s not what the state is shooting for either. Chris Maisch, the state forester, said the state’s perspective hasn’t changed: Alaska shouldn’t have to follow the Roadless Rule. Ultimately, it’ll be up to the Forest Service to decide which of the advisory committee’s options will move on for an environmental analysis — with the state acting as a cooperating agency. It’s expected the public will get another chance to weigh in this summer. A final decision on Alaska’s Roadless Rule is anticipated by 2020.